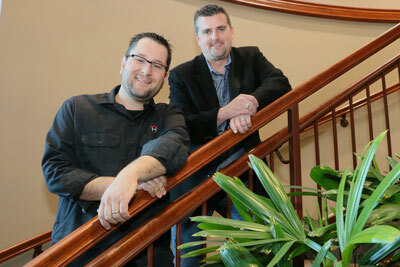 Co-owners Dave Vogtman and Nick Dolphens started The Home Company almost three years ago. The two had come from another builder and had a lot of ideas about how to do things a little differently. They wanted to fill a niche in the market that they didn’t see available, for more affordable homes that offered customization at a particular price point. Dolphens went to architecture school for a couple years but decided he wanted something more tangible and switched to construction management. Even though in college he wore a tool belt and did roofing, Vogtman came into construction and building through the business and sales side of it. The two have been in the building business for 15 years each and have a lot of experience between them. Dolphens focuses on construction and Vogtman handles day-to-day operations as well as coordination with sales and marketing. The Home Company builds homes from the ground up, which is a process the two owners said takes about six months. This year, they have increased the number of floor plans they offer from two to three, which includes a new price point. The new line is called the Innovate Collection and serves a price point of $225-$250k. That’s a price point the company hasn’t offered in the past. This line is geared primarily toward first time homebuyers. The bread and butter of their business is their Elevate Collection, which covers the $250-300k range. These homes typically appeal to those who want to move up with their second home or retirees who want to scale back from a bigger house to a smaller one. Vogtman said these are chiefly ranches and two stories. Their final line is the Create Collection and is fully customized, with houses starting at $300k. The Home Company partners with Boyer Young Land Development, as far as purchasing their lots, so they have good availability all over the city. Quality and innovation of design are two things The Home Company focuses on. The company is on the leading edge in Omaha in terms of the number of energy efficient homes they are building. Being a newer company, Vogtman and Dolphens said they look for nationwide and local trends for their designs and focus on how people want to live today versus how they lived while growing up. At any given time, The Home Company is working on 45-50 homes. The two estimate they will finish about 100 homes this year alone. Vogtman said they only design homes that feel good to live in and that are suited to the way their customers want to live. With floor plans that are extremely flexible, the company never builds the same home twice. Dolphens and Vogtman design their own plans and create a unique experience for each buyer. Dolphens said his favorite part of the business is designing clients a house that meets their needs and tying that plan into how they envision their future while also making it efficient. “For me, it’s the end experience, when I get to see them living happily in their home, it’s why I get up and do what I do every day,” said Vogtman.